The most recent signal was a BUY on April 27 @ 20.50. VXX is now about 8 points or 40% higher. Looking at initial quotes, that kind of percentage move is worth 5X in options, or about 200%. 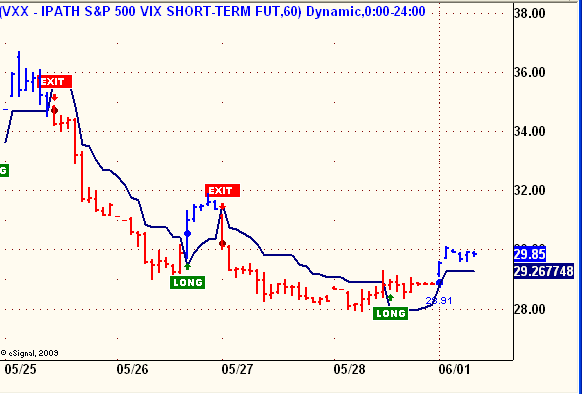 Shorter-term the VXX 60 minute model does a nice job of capturing smaller moves. 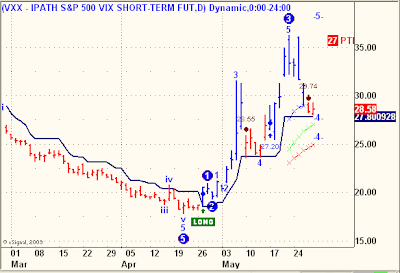 It appears that as small as a one point move in VXX is worth 20-25% in the near-term options. Now that calls and puts are available on VXX, I'll be keeping a close eye on how well VXX trades both shorter and intermediate term. Looking forward to NNVC charts after the significant success of the recent denge virus tests. chart looks like its heading for a double bottom ,which is ok If it holds there . Chart looks like its half way to creating a giant cup for a cup and handle pattern. the current area and major support levels look like the bottom zone for the cup. Are you saying if 1.50 holds, we can reach 3.50 in the next few weeks? some great analysis lately Allan...thanks...respect the trend. I gave an example above of how the end of day signals could generate 200% gains. Even if half of them fail for 25% losses, a few that work with triple digit gains are enough to make this a winning system. Intraday models work as well, although trade more frequently with more whipsaws. I recommend everyone learn the trend system on Daily Models first, then move on to shorter-term trading, if necessary. If the market breaks down here, forget about NNVC. Easily can see sub $1 levels again. Its testing trendline support right now and its 13 ema has crossed below it's 34 ema....not a good sign. I appreciate the good news as well as the bad. Liam, two responses for you. 1) Forget what the last poster said about the 13 and 34 EMA .those moving average lines are not of much use.they are rarely used as markers by investors,hedge fund mgrs,or banks.The only time one would want to look at the 14 or 20 MA is during a strong parabolic rise or fall. also I would forget about the doom saying forecast he also proposed that if NNVC falls below 1.50....blah blah... with no explanation of his logic. Anyone who bothers to post serious comments owes his audience a Full explanation in complete detail. Otherwise ,it just serves as an inflammatory comment with little value for the reader. 2) When I said NNVC could have a target of 3.50 area....thats the technical target zone based on the dimensions of the cup and handle that is (would be) forming. I dont know how you came to that presumption. There is no immediate time frame for the target ,it just has to be watched. I also would not want to enter now at 1.60 as an "all in " investment. please send the magic plunge protection team now. please oh please oh please dear lawd. its time lord blankfein.its time. Any still potential in that? What I am sorry for, it is my uneducated comprehension of the market. What would have been so wrong to have sold 10000 shares @2.50 and buy back now @1.50! I did not and that is my error! If it goes back to under a dollar...that is fine. I like this stock, but I am disappointed in myself as a budding trader. I did not take a good profit! Liam,I struggle with that same thing myself ,the puzzle game of timing markets,and targets,its impossible to always be right. yes,as a trade,buying at 1.00 and selling at 2.50 and rebuying at 1.50 would be reasonable. There are many strategies to consider about investing. The choice between buy and holding a Core portfolio or just looking to Trade the Trend....or a combination of the two. My own method is to have a portion as a core portfolio,which I dont sell.but the trick to that is having a very good entry point at the lowest bottoms. (like the march 2009 or july 2009 low.) or like with NNVC an entry at .70,or .60 from last fall. I have ISCO at .60 from last fall.and UPWRF at .66 from last fall. These are some of my core portfolio. I dont worry about them because of the low entry at those prices. But I also have some poor entry points in core holdings like BTIM at 7. I really want BTIM at 4. Thats a big difference. So having a core portfolio is one part. The other part is to have a trading portfolio that I want to buy and sell the swings. because its a good stock to own so I'm ok to just hold it ,but the plan is to sell it at the target. and follow the trends. My trading portfolio has had stocks like CHK,YONG,and a few others.still evolving. I think in the current geo-political economic big picture, its hard to decide what will work best ,for growingand protecting income. If you believe the global economy is heading for more serious trouble,do you sell everything and hold usdollars on the sidelines? 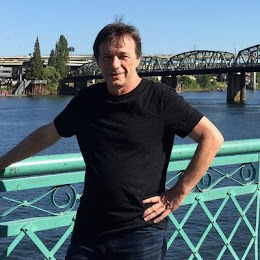 or do you buy gold and silver mining stocks,and bullion? which means ,do I sell all my mining stocks and go into cash? or hold the stocks and even buy more? What will happen to the biotech stocks if the market collapses again? Almost impossible to know what will happen. and whats the best way to play it. So far, the mining stocks have not taken as bad a hit as the S+P has.thats bullish for the miners. for the stick save I prayed for. and also for the one at (S+P 1081) exactly where they should be. as sure as purgatory is inbetween heaven and hell....I do love my plunge protection team. Let us pray....lord please hold the S+P up at the 1084.50 to 1086.50 Glorius Gap up . Let it be the next support on our way to heaven.or at least the upper edge of purgatory (S+P 1130). Then,Lord, please propel the magical market up through 1100 to hit the magical pivot point 1115....and then ,lord,please protect us from plunging into hell again. Keep us safe from temptation and forgive us for buying BP at 50. Thank you god for making me sell it back at 49. Mary mother a god... thank you god. but now,lord, we need you always to stick save us from evil. we look up to see the stars and so we look up to see the heavenly profits of a rising market. I lay my prayers at the feet of the retracement gap at 1085....give us this day our daily correction to 1085 and redeem us back up to 1115 to complete some kind of wave I dont know anymore what the devils wave could be....I only see the pivot point where the angels are dancing.Lawd take us there. Blessed be the lord blankfein and the plunge protection team. There is a god.